Now that it’s officially the “Holiday Season”, if you’re like most people I know, as much as we would like to be in good spirits, we all know the stress it can cause. It doesn’t make it any better when there are those already dealing with a mental health illness. But it doesn’t have to be so bad after all, especially if food is involved, right? We know it’s fall time when the weather gets cooler, the colors outside change, and of course we begin to hear Christmas music everywhere we go, even if Halloween was just two days ago. The joyous anticipation towards the holidays is what most just can’t wait for all year long. Grandma’s sweet smelling baked goods, cooked to perfection turkey, and all the sides one can ask for while enjoying it all with your loved ones and friends. Making your plate look like Splash Mountain at Disneyland, then knowingly preparing for the ultimate food coma that will inhibit your body for at least two hours on the couch while watching football or family movies. Ahhh yes its time to eat everything in sight now, and start fresh all over again by going to the gym on January 1st. That’s generally the plan, right? 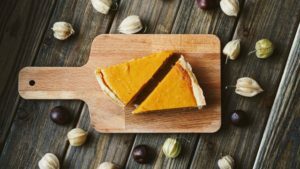 Well, what if I told you, you can incorporate five certain foods during the holidays that can actually help with your mental health, would you eat it? The mental health benefits of certain holiday foods go beyond the food memories that make you feel good. The nutrients in these five foods can deliver a solid boost to your mood, which is something we can all use during the stressful holiday season. This may be the most known holiday food used, but did you know that pumpkin contains minerals that boost brain function? Pumpkin contains Lutein and Zeaxanthin, which are both excellent nutrients for boosting memory recall in both younger and older adults. The pumpkin seeds contain the amino acid Tryptophan and help your brain produce serotonin, a chemical known to boost your mood and give you an overall content feeling. So eat as much pumpkin pie as you can, well in moderation I guess. When I think of Thanksgiving or Christmas, my first thought is the smell of cinnamon sticks as I walk into my Aunts house I visit every year. 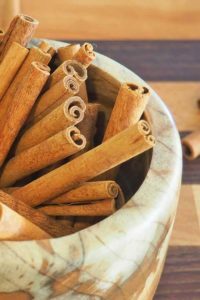 Cinnamon adds warmth to the flavor in teas, cider, oatmeal, bread, baked fruit and veggies, and more. Try making cinnamon roasted almonds, cinnamon rolls which are always a kid favorite, or you can get your healthy on and try making a cinnamon spiced pumpkin hummus, and incorporate two great holiday foods. But the benefits are even better by helping in stimulating your brain, and also helps regulate blood sugar, which contributes to an overall steady mood. Turmeric is considered a wonder spice for so many health conditions including reducing the symptoms of depression. Tumeric has powerful antioxidant and anti-inflammatory properties also which is great for your overall well being. 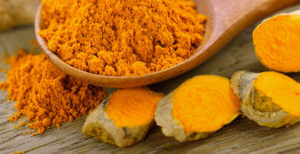 There are many ways you can use Tumeric. Try it by spicing up your chicken or turkey dish, or add it to your soups, or just simply add it to your coffee in the morning. Don’t worry, your body will thank you later. If you do use Tumeric in your dishes, remember that although it does taste very delicious, a little bit goes a long way. You can find apples in your local store all year long, but September and October are the best months to get apples. Over the past several years, nutrition research has focused on the effects of apple consumption and its relationship to providing protective neurological benefits. 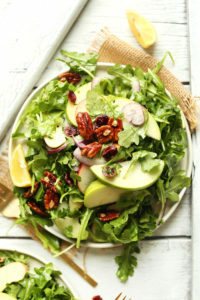 You can use apples in any salad, or a salsa dip, also try baking some apple chips in the oven to eat with your apple salsa dip. 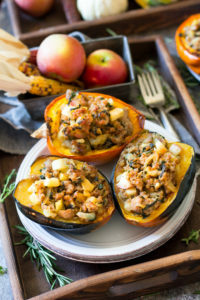 Acorn squash is a small type of winter squash with a light yet slightly sweet flavor. Acorn squash is one of the most nutrient-dense squash varieties and contains higher amounts of antioxidants than other squash in general. It contains magnesium, which is an important nutrient for helping with depression and anxiety. Try stuffing it with some cinnamon and fruits such as apples or peaches, or for your meat lovers try stuffing some of your favorite meats. I guarantee it will taste great while helping to decrease anxiety and depression. I hope this was helpful and gives you some ideas for taking a healthy choice dish for your next family holiday party. With the well-known stressors that can be triggered during the holidays, we can all use anything and everything that can help remedy the chaos during this busy yet wonderful holiday season.